Surprise! We are having #SundaySupper today instead of on Sunday. 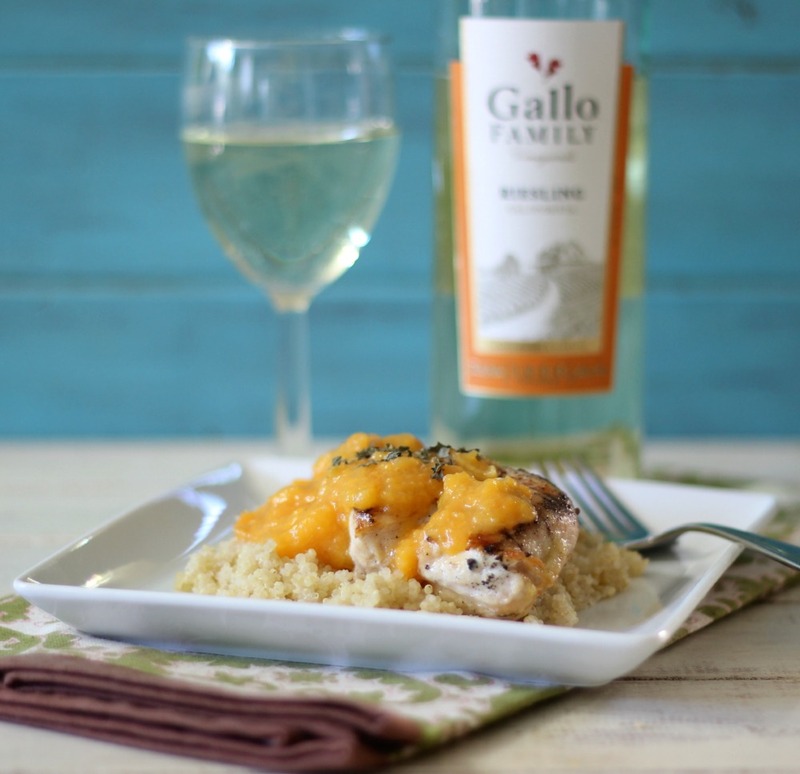 Today #SundaySupper teamed up with Gallo Family Vineyards to share Labor Day recipes. Can you believe it is already the end of summer and were thinking of Labor Day? 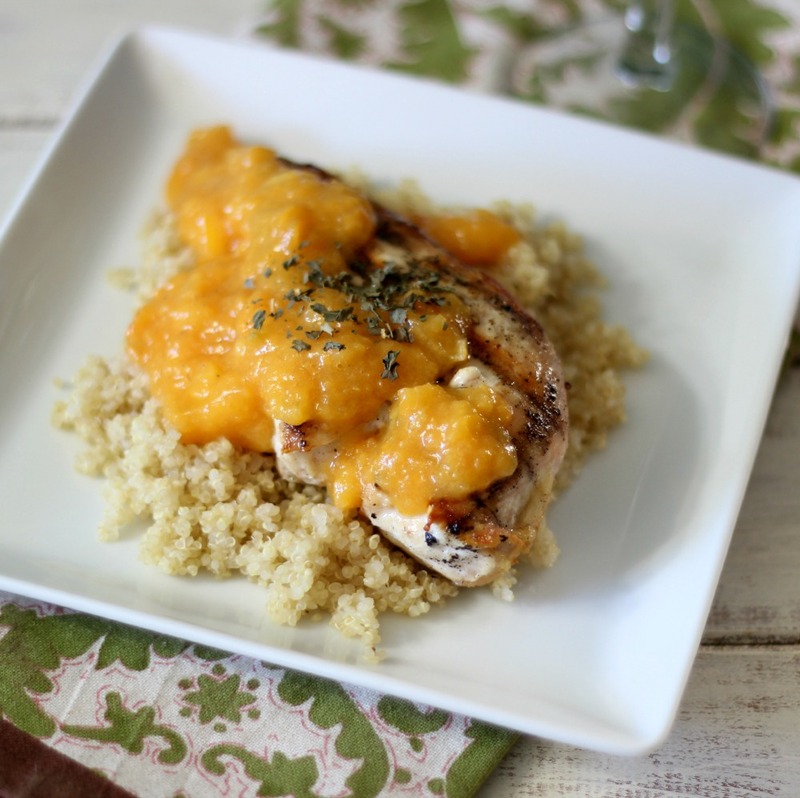 I am going to miss all of the summer produce, so with that in mind I had to use fresh peaches that I picked up from the Farmers Market in todays’ recipe; Peach Mango Grilled Chicken over Quinoa. An amazing simple meal with a ton of flavor. This dish is so easy to make. Its light, refreshing, savory with a pinch of sweetness. I think it is perfect for Labor Day and it’s perfect for a quick dinner. 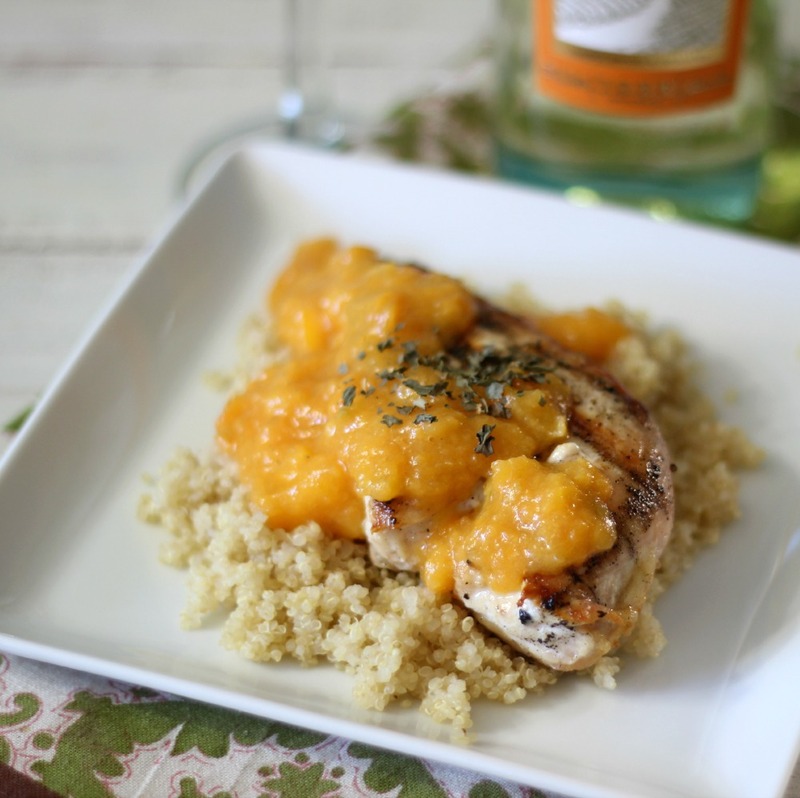 It’s grilled chicken, covered with a peach mango sauce that is made with Gallo Family Vineyards Riesling, topped on a bed of quinoa. Delicious!! To make the dish I simply sautéed together fresh peaches, mango, cornstarch a pinch of sugar and GFV Riesling. I cooked it until it became thick and slightly saucy. To make it more creamy, I added it to my blender and processed it until it was slightly smooth, with little chunks of fruit. While I was cooking the sauce, I cooked my chicken on the grill. I didn’t add much seasoning to the chicken, just a little bit of olive oil and pepper. One thing I did was cheat. I bought frozen quinoa that was already cooked. All I had to do was heat it up in the microwave. The whole dinner took about 20 minutes to make. Not to bad, and it tasted restaurant quality. I was surprised because I thought with the fruit that it would be sweet, but it wasn’t. It was a perfect balance of sweet, but also savory. It was a hit with the family. I think quinoa is finally starting to grow on them. Yeah! In a skillet add peaches, mango, cornstarch and sugar, mix together. Add Gallo Family Vineyards Riesling. Cook over medium, low heat for 10 minutes; until thick and soften, stirring constantly. Add to a blender and pulse a few times until it smooths out a pinch, but leaves chunks of fruit. Set the grill to medium heat. Brush the chicken with olive oil and sprinkle with ground pepper. Cook one side of the chicken for about 7 minutes, flip and cook for another 5 minutes, until chicken is no longer pink. Evenly divide the quinoa between 4 plates. Add 4 oz. 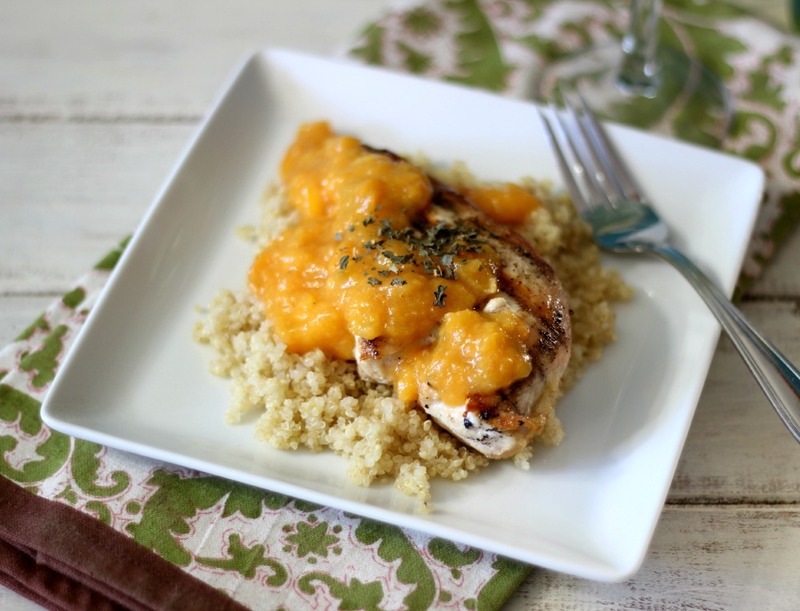 of chicken over each plate then top the chicken with peach and mango sauce. I am absolutely loving this meal and I think you will too! So easy to make, perfect for a summer night meal. 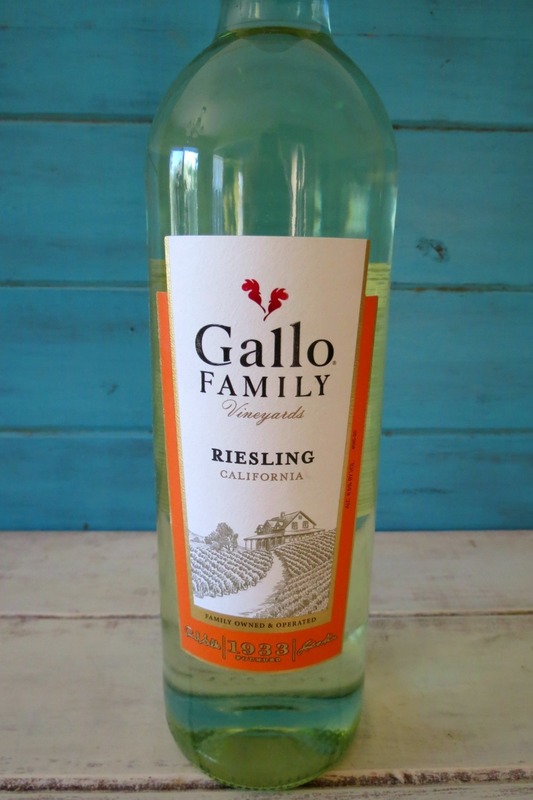 I am loving Gallo Family Vineyards new Riesling. The Riesling whispers of honeysuckle, juicy peach, pear and ripe citrus. Whether you are serving barbecue from the grill for family and friends, or a savory pasta for two, this incredibly versatile wine will pair beautifully. It’s the perfect compliment to your summer dinners, and goes very well with a night on the patio watching the sun set! You can check out Gallo family Vineyards Labor Day Recipes here. Don’t forget to check out what Labor Day dishes the #SundaySupper crew made. P.S. I won’t be around much this week, as I am heading to Baton Rouge, Louisiana. But don’t worry I will get your messages and be sure to check in with you everyday. This looks amazing. I might try it with pork chops too. Oh wow this looks sooo delish! And Renee is right, this sounds great for pork chops too! This looks so healthy and delicious! I love the combination of quinoa and peaches!! This is such a fun idea. Love love love it! That sauce looks so vibrant and fresh! I cannot believe it is already almost LABOR DAY!! What a tasty looking dish, can’t get enough of peaches right now!! You did this in 20 minutes?!? High five, lady. This looks like a restaurant quality dish with none of the guilt. Love it!